Fast food chain McDonald's will recruit more than 10,000 people, hike salaries of existing staff and set up training and development programs for employees this year, its country head told China Daily yesterday. Kenneth Chan, the newly appointed chief executive officer of McDonald's China, said the chain will open more outlets this year to keep pace with rising business growth. The company will also incorporate more performance-oriented metrics and raise employee salaries nationwide by at least 6.3 percent, Chan said. This is Chan's first public announcement of the company's strategy for the year after his appointment last month following the exit of Jeffrey Schwartz, the former China chief who bid farewell to McDonald's after working with the chain for 40 years. Chan's appointment comes at a time when the financial crisis has spared very few countries, including China. And, sustaining the growth momentum of McDonald's under Schwartz will be a key challenge for Chan when Chinese consumers are actually tightening their belts. "Actually, I am not concerned about China, as I am confident about the long-term potential of the market," Chan said. "This year will mark the beginning of the company's most rapid expansion in China." Last year, McDonald's said it planned to add 175 new outlets in 2009 to the current 1,000 it has in China, the biggest addition ever. In the interview, Chan refused to disclose new outlet numbers for the year. 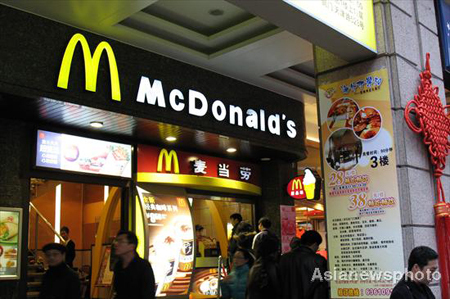 In 2008, the head count at McDonald's China outlets grew by 8.9 percent, double that of the United States and the European Union, making China its fastest growing market worldwide. Susanna Li, vice-president of human resources at McDonald's China, said besides recruiting more people, it will also invest in training and developing Chinese talent. 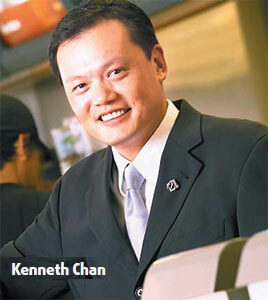 "McDonald's is not only a company that sells hamburgers, but also a talent-oriented enterprise. McDonald's has been trying to create training opportunities for different levels of staff," she said. KFC is the largest fast food chain in China, with more than 2,300 stores in 450 cities. Company executives told China Daily last December that KFC would open more restaurants in 2009 than "the previous year's average of 400" new food joints. Sources said KFC's annual recruitment figure for the year will also exceed 10,000 people. McDonald's set up its Hamburger University in Hong Kong in 2000, also its seventh worldwide, to train its Chinese staff. The company plans to open another on the Chinese mainland next year. The company also launched the China Development Leadership Program this year, which aims to develop skills that will help employees find the best location for new outlets.